Not a lot of imagination about what to name the town 8 miles to the south of Rio Verde. 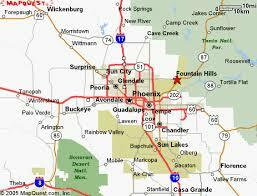 Fountain Hills, Arizona is home to the worlds fourth tallest fountain with it’s water show, and many community events. Bordered on the east by the Verde River, and to the west by the McDowell Mountains, the town of Fountain Hills feels like an extension of Rio Verde. The question asked by newcomers to Rio Verde is: “where do you go to get groceries?” The answer: “Fountain Hills!” There is a diverse shopping experience in Fountain Hills that exceeds just groceries. Boutiques, specialty shops, medical clinics and services, restaurants, galleries, health clubs, auto repair and rental, cleaners, print shops, UPS and Fed-Ex drop off, nail and hair salons, spas and national chain retail stores such as Target, Pier One, Petco, Ross and Starbucks. Looking to have a day in town while staying in Rio Verde? CopperWynd Resort and Club features luxury accommodations with a full service day spa, swimming pools, lighted tennis courts, and the Alchemy Restaurant and Wine bar feature an exceptional dining experience. Looking for a little more casual and exciting pastime? Try on the Fort McDowell Resort. Just on the way out of Fountain Hills on the Beeline Highway (SR 87), “the Fort” offers a AAA Four Diamond resort and casino, Large outdoor pool and kids area, Full-service Spa and health club, We-Ko-Pa Golf Club with two award winning 18 hole courses, horseback riding, and the Eagle View RV resort. Next PostWhere to hike? It’s Fountain Hills! Sounds like a great place! I’ll have to check it out!! 🙂 Very nicely written and well researched post.